These unique myGodTags™ are a non-traditional take on standard military issued dog tags. Each myGodTag™ was created from an original drawing or piece of artwork. Then it was made into a stamp, which was then used to create an impression in wax, and later cast into a sterling silver tag. These solid sterling silver tags are handmade in Texas. Each tag comes with an adjustable leather cord (shown in middle of photo). 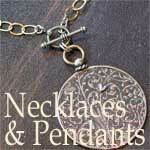 The tags come with a card that shows the symbol and its meaning, and the scripture reference. 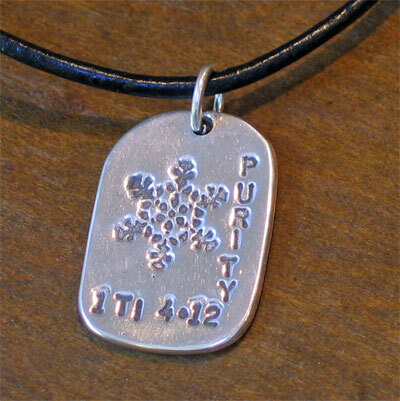 PURITY - THE SNOWFLAKES SHOWN ON THIS TAG REPRESENT THE PURITY AND UNIQUENESS OF EACH SNOWFLAKE, WITH NO TWO EVER ALIKE. AS CHRISTIANS WE ARE THE SAME, GOD'S PLAN FOR EACH OF US IS DIFFERENT BUT THE ONE THING THAT HE WANTS FOR ALL OF US, IS THAT WE SET A GOOD EXAMPLE FOR OTHERS IN ALL THAT WE DO, SO OTHERS MIGHTS SEE CHRIST LIVING WITHIN US AT ALL TIMES. ...SET AN EXAMPLE FOR PEOPLE IN SPEECH, IN LIFE, IN LOVE, IN FAITH, AND IN PURITY. 1 TIMOTHY 4:12.